Published: June 20, 2014 at 03:05 p.m. Updated: June 20, 2014 at 04:11 p.m.
As much as play-by-play announcers might hope for a game in which a big play involves John Smith and not a difficult name to pronounce, college football tends to not offer that opportunity with a plethora of unique names. Who has the best in the sport, though? CFB 24/7's "14 for '14" series continues with a list of the best names in the sport -- the list is limited to players that have contributed for their teams (sorry, Tulane's Fudge Van Hooser) or are freshman. Buzz: Money -- actual first name is Monshadrick -- is the son of Major League Baseball outfielder Torii Hunter, who also has a son playing at Notre Dame. 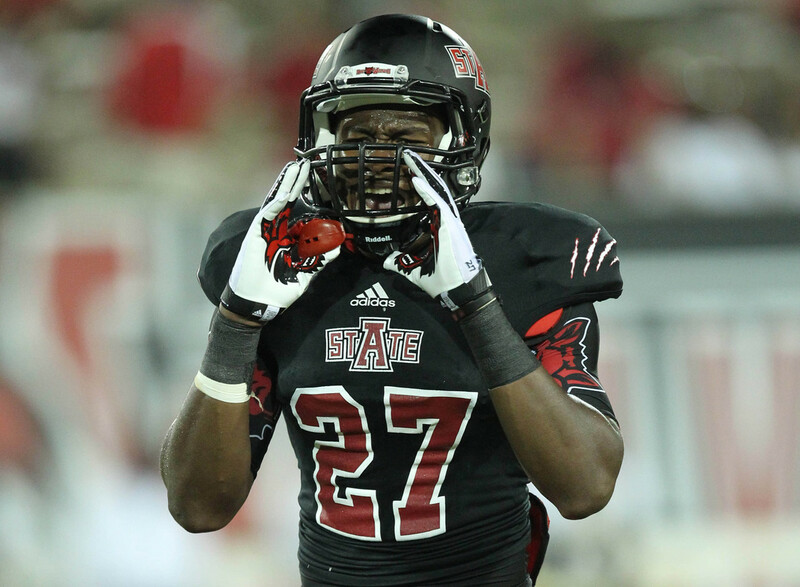 Money got on the field as a true freshman for the Red Wolves in 2013, registering 36 tackles and 2 pass breakups. Buzz: That is an unfortunate last name for a player many fans will hinge hopes on to come through in the clutch with a game-winning field goal. However, Pitt fans might be able to keep the faith in their kicker. Blewitt seized the starting placekicking duties for the Panthers as a true freshman in 2013 and wound up leading the team in scoring with 82 points, which set a freshman kick-scoring record at the school. Buzz: Liner has been on the all-name team for some time because he's a defensive lineman named Dee Liner. Repeat, a defensive lineman named Dee Liner. He was one of the top recruits in the country out of Muscle Shoals, Ala., and should become a part of the rotation along the line in 2014 for the Crimson Tide. Buzz: One of the top defensive tackles coming out of high school, he was at one point committed to Florida State before switching to LSU. The big fella should compete for a job on the interior of the line this season after redshirting in 2013. While his unique first name draws people in, his last name should draw plenty of comparisons to the villain from the Batman saga. Hopefully he uses the Bane voice in the trenches to intimidate the opposing linemen. Buzz: An early enrollee who is expected to be a big contributor to the Buckeyes' defense, McMillian was considered by many recruiting experts to be the top inside linebacker in the country. It also goes without saying that his parents Monica and Rafael must have been huge Wu-Tang Clan fans to name their kid after the rapper Raekwon, who rose to prominence with the group in the 1990s. Buzz: The South Carolina prep played in three games last season for the Tigers as a redshirt freshman, but had to be a fan favorite along the line with his name. You have to wonder if teammates call him Mr. President when addressing him. Either way, he was born to sack the quarterback and celebrate by doing a salute. Buzz: While he was born years before the series "Jackass" entered pop culture, it's still impressive to have a nickname that invokes stunt comedian Steve-O minus the hyphen. He racked up 18 tackles last season for the Rams, but is best known to fans for forcing a fumble on a kickoff return in the final minute of the Gildan New Mexico Bowl last year that allowed the team to complete a comeback in a crazy game. Buzz: Play-by-play folks have to love saying his last name when he makes a big hit or tackle. And make no mistake, the Hawaiian can put you on your back. He played a little on special teams and as a fullback, but appears to be making the switch to defense for the Huskies this season. He's also an accomplished rugby player to boot. Buzz: The Bearcats might have the best overall team names with Mouhon sharing a locker room with Gunner Kiel, Munchie Legaux and Leviticus Payne, among others. He's appeared in 26 games for Cincy and had an impressive 9.5 sacks last year as a redshirt sophomore. Buzz: Cracraft narrowly edges out incoming Cougars freshman Hercules Mata'afa for best name on the team, but he certainly is one of the more accomplished players on this list after earning All-Pac-12 honorable mention honors as a true freshman last year. He's no joke as a wideout, and should continue to put up numbers in Mike Leach's Air Raid offense thanks to his soft hands and savvy route running. Buzz: College football suffered a big loss in the name department when Navy's Wave Ryder ran out of eligibility for this list. Luckily his brother Blaze can fill in with an even cooler first name. While Blaze isn't quite the on-field standout his older brother was, he is a returning starter along the line for the Midshipmen. Buzz: Sadly, the linebacker was not born on Feb. 14, but he is familiar to fans of the all-name team over the years. He led the Tigers in tackles during their run to the national title game and has started since he was a true freshman. No word on how he is with the ladies, but he's probably OK with that first name. Buzz: No, he is not from Middle America but rather hails from Nashville. While it would have been more appropriate if he wound up at Nebraska, one can't blame him for opting for better weather at Miami. He was mostly seen on special teams last year for the Hurricanes, but contributed some in the secondary as a true freshman. Buzz: Clax, the Huskies' fullback, will be one of a number of people in the backfield looking to boost their totals after the team's leading rusher transferred. He played in three games last year as a redshirt sophomore and ended the season with just 11 yards on seven carries. Hopefully for fans and broadcasters, he'll see the field a lot more often in 2014.